the regina mom knows that Mr. Harper clearly stated, numerous times, that a Conservative government would not re-open the abortion debate. Yet, on Thursday, April 26, she watched Members of Parliament debate Motion 312, which ultimately seeks personhood rights for fetuses which would enable the re-criminalization of abortion, as well as deny the constitutional rights of all pregnant women. In other words, it is yet another backdoor attack on women’s Charter rights. And, the regina mom knows that the Prime Minister is not a stupid man, well, not unless power has gone to his head, that is. He must have known that Motion 312 was an attack on women’s rights. And, contrary to what some in the mainstream media and elsewhere have said, there are at least a couple of ways the Harper government could have stopped the abortion debate from being re-opened. The blogger, Dr. Dawg, has clearly described how the Prime Minister and the all-party Subcommittee on Private Members’ Business of the Standing Committee on Procedure and House Affairs could have stopped Motion 312 from making it to the floor of the House of Commons. Basically, there was not political will within either the Conservative Party to either further investigate it or stop it. And so it proceeded. A harsher way of stopping it could have been for the Prime Minister to expel MP Stephen Woodworth from the CPC caucus when he first got wind of Motion 312. Doing so would have sent a very strong message to Canadians, a message which would have indicated that he really meant what he said when he said, “No debate.” But the Prime Minister did not do that. He lacked the conviction to demonstrate that strength. Granted, when under pressure in the House of Commons he did say that he would oppose Motion 312. That, to the regina mom, was a small relief. She was a tad more relieved when the government whip, MP Gordon O’Connor, Minister of State, spoke very eloquently against Motion 312. Perhaps the greatest relief to the regina mom came when she was reduced to tears. Perhaps it was not relief, but sadness, anger, appreciation, respect or perhaps a mixture of all. But when Niki Ashton, the NDP Critic for Women, delivered her speech in opposition to the motion the regina mom‘s tears started to roll. Perhaps upstaged by O’Connor on some points, Ms Ashton spoke to the heart of the issue for the regina mom. The reality is that the issue of abortion was settled in 1988. In 1988 the Supreme Court of Canada struck down Canada’s abortion law, ruling that it was unconstitutional. The justices found that the law violated Canada’s Charter of Rights and Freedoms, because it infringed on a woman’s right to life, liberty and security of person. That was 1988, almost 25 years ago, a generation ago. This decision came about after years of work from women who, from across the country, sent the message that women ought to have the right to choose, that women ought to have the right to decide their future, that women ought to have the ability to define their destiny. —limiting the right to the “personal care and control of one’s body” is a violation of a most “basic and fundamental right”, that of “reproductive choice. As long as I am prime minister we are not opening the abortion debate…The government will not bring forward any such legislation and any such legislation that is brought forward will be defeated as long as I am prime minister. That comes from an article in the Globe and Mail, from Wednesday, December 21, 2011. An article written around that same time quoted the Prime Minister as saying, “As long as I’m prime minister we are not reopening the abortion debate”. This is the Conservative Party’s Trojan horse agenda. During an election, and even here in the House of Commons, the Conservatives tell Canadians one thing. Then, as a minority government and now as a majority government, we see what they truly mean. If the Prime Minister did not want a woman’s right to choose to be debated, we would not be here tonight. What is interesting is the Conservatives felt the need to tell Canadians something else so those same Canadians would vote for them. They waited until they won a majority to then uncover their hidden agenda. Indeed, the hidden agenda is hidden no more. the regina mom saw it right here on her computer screen. She watched Members of Parliament debate a motion about abortion, a motion that was introduced by a Conservative Member of Parliament. Perhaps it could be called the No Debate Debate. Today, on Parliament Hill, the Radical Handmaids gather in opposition to Motion 312, the anti-choice motion that seeks to redefine when human life begins. The Motion will be debated in the House of Commons on Thursday. The Handmaids’ action, based on Margaret Atwood’s novel, The Handmaid’s Tale is sure to be an interesting one. Sporting red garments and “Flying Nun” hats in an allusion to Margaret Atwood’s classic novel The Handmaid’s Tale, the Handmaids are protesting Bill M-312 as a regressive attack on women. “The Handmaid’s Tale shouldn’t be an instruction manual,” said one young woman, who identified herself only as “OfStephen” (“Woodworth or Harper, take your pick”). In Atwood’s novel, set in a futuristic America transformed by religious fundamentalists into the Republic of Gilead, women are judged by whether or not they are capable of bearing children and, if fertile, are enslaved to men of the ruling elite who forcibly impregnate them. “We’re watching what’s going on in the United States with the war on women and we know the Conservatives are trying to sneak it up here,” said another OfStephen, standing in front of a display of brightly-coloured knitted uteruses. Supporters across the country have been sending the Handmaids knitted wombs and vulvas, using patterns available on the Internet. When they have enough, the Handmaids say they will deliver the woolly parts to any MPs who vote in favour of Woodworth’s bill. “If they want to control our uteruses so badly, they can have a womb of their own,” said OfStephen. As some of you may already know, the regina mom has taken to occasionally performing at the local slam poetry event in Regina, Word Up Wednesday. 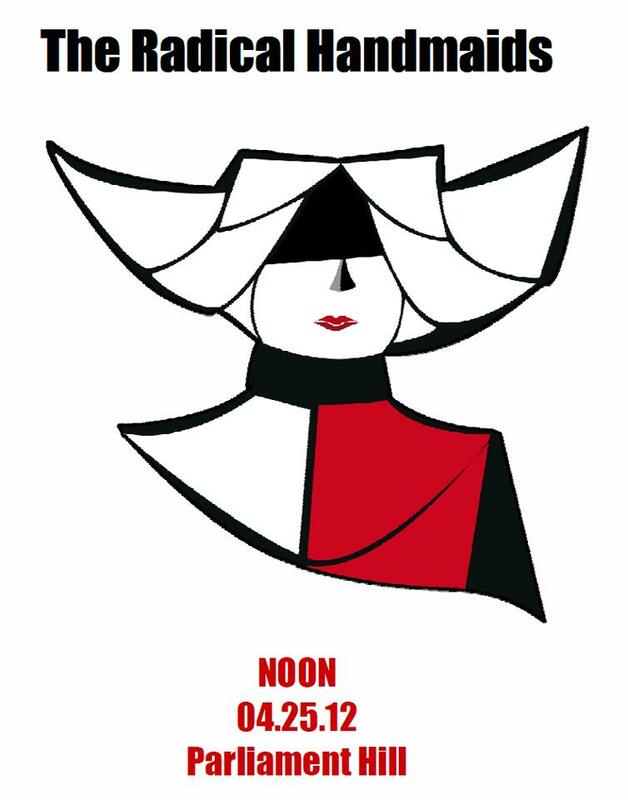 This Wednesday, April 25, she will be there with new and old poems to share and be judged on. She would love to see friends in the audience! As well, watch this space — and others in the Canadian Progressive Voices blogosphere and beyond — for a blogburst on Motion 312, the motion put forward by a religious zealot in the House of Commons. If passed M312 will re-open the abortion debate in Canada. You can read more about the blogburst over at my friends’ place. Starting today, all bloggers who support a woman’s right to choose can and should blog fiercely about this CONservative, regressive attack on women’s right to choose. Rest assured, there will be many posts to read, covering many different angles on the issue — angles I hadn’t thought of before becoming active in the Abortion Rights Coalition of Canada / Coalition pour le droit à l’avortement Canada and reading the multitude of materials available there. If you haven’t already done so, please download, print and sign the petition in opposition to M312. As signatures roll in the petition will be presented to the House of Commons by various prochoice Members of Parliament over the next while. the regina mom managed to gather almost 20 signatures last night just by pulling it out of her purse! Someone else did all the work getting her friends to sign. Thanks for that, Karen! And now I’m off to my sunshiny garden to contemplate what will be planted where this year. In the 80’s, it was the Devine regime provincially and the Mulroney machine federally that moved the regina mom into political activism. The issue of reproductive rights got her involved in the women’s movement of the day. And here she is, more than 25 years later, again working on that file. On Thursday, April 26, the House of Commons is scheduled to debate MP Stephen Woodworth’s Motion 312 which ultimately seeks to make abortion illegal. If passed, the abortion debate in Canada will officially be re-opened. Yes, one year ago the Prime Minister said he wouldn’t re-open the debate. But, do you trust him? Does any Canadian woman believe him? the regina mom doesn’t. That’s why she’s been working with the Abortion Rights Coalition of Canada to mobilize women across the nation. Already, more than 11,500 have signed our digital petition. It’s heartwarming, really, to know that so many support the efforts of a few dedicated volunteers and, more importantly, the right of a woman to control her own body. ARCC has now decided to initiate a signature drive on a hard copy of the petition. This will allow it be part of the public record via the House of Commons. ARCC has contacted various prochoice Members of Parliament of different political stripes for assistance. the regina mom encourages you to contact your Member of Parliament to see where s/he stands on the issue of women’s reproductive freedom. And, the regina mom would love it if you would help out, too. Arm yourself with information. Then, take a moment to print out the petition (PDF) on 8.5 x 14 paper, invite your family / friends / co-workers to sign it and then send it to the ARCC. We’ll make sure it gets to a prochoice MP for presentation to the House. 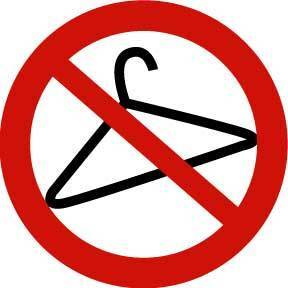 *When abortions were illegal, women would use any means at their disposal to terminate a pregnancy. Coat hangers were easily accessible and often used. Women died as a result of botched abortions. The graphic, Never Again, is the ProChoice movement’s statement that we will stand guard so that we will never again go back to those times.